In eastern forests, changing climate and land-use are affecting forested ecosystems in ways that will have important economic and ecological consequences for centuries. Decisions we make now will have sustained impacts on these trajectories (e.g., shifts in net carbon sequestration, forest composition, and fire regime), so it is important that we develop reliable forecasting and assessment tools. Forests in eastern North America have rich historical data about past ecosystem change including historical forest surveys dating back to the settlement era, fossil pollen and charcoal records from sediments, and various paleoclimate proxies. 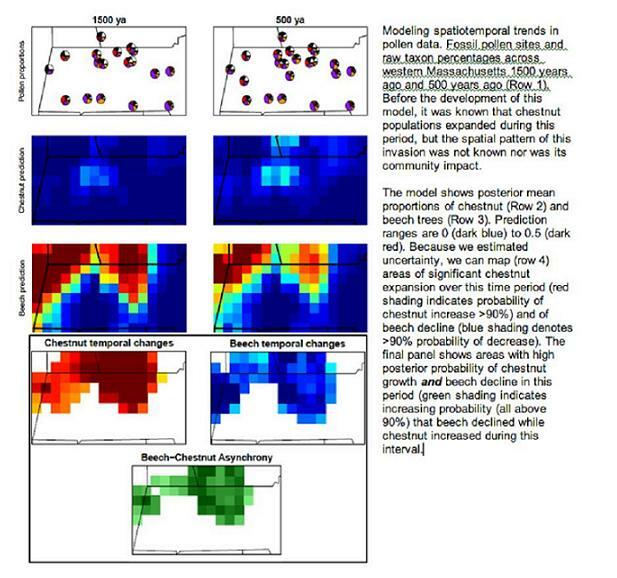 For paleoecological data to inform ecological forecasting at regional to continental scales, it must link networks of biotic and abiotic change in the context of process-based modeling efforts. For this to be successful requires that we bring paleoecologists, statisticians, and ecosystem modelers together. Developing a coherent inferential framework with rigorous estimates of uncertainty for the purpose of reconstructing ecological variations in forested ecosystems for the last 2000 years from the Great Lakes to New England. Applying these reconstructions to test the process-based ecosystem models being used to forecast ecosystem dynamics, with emphasis on processes operating at decadal to centennial scales. These processes are essential to 21st century ecological forecasting, yet remain poorly constrained by ecological observational datasets. Conducting systematic and coordinated field campaigns to collect new paleorecords from the northeastern US that are based on priority gaps identified by the PalEON data-assimilation and model-validation working groups. Gaining a richer understanding of how climate variations across a range of timescales have shaped the composition and function of forested ecosystems. To learn more about PalEON, visit the project website at paleonproject.org.